When it comes to building your new house, remodeling your existing house or even building an addition to your home such as a garage or great room, there are many options to choose from when it comes to framing. Why choose a timber frame? Few materials measure up to the beauty and versatility of timber. Here are a few benefits of choosing timber over other materials. Its easy to say that timber frames add beauty and distinction to any house project. Posts and beams and timbered rafters immediately stand out as unique architectural details. Their strength and character stands out, often striking awe and fascination into the observer. But its the subconscious connection that is not always realized. An exposed timber structure is easy to interpret, and consequently allows people to “understand” the building easier, rather than when structural members are hidden behind drywall or skins of paneling. Its what architects call “scale” – the connection of the inhabitant to the home – the opposite of towering skyscrapers of glass! A timber frame is very versatile in that it allows you the ability to add materials to your building that enhance both thermal and acoustic performance. Timber frame construction allows you the ability to easily install materials outside the frame, uninterrupted that help insulate your home from outdoor sounds and temperature fluctuations, making it easier and less expensive to maintain a comfortable, healthy, energy-efficient interior environment. Timber frames have demonstrated their ability to withstand hurricane force winds better than many other framing materials due to timber’s strength, and ability to flex and move with the forces of nature. Timber also offers the same durability and sturdiness of more rigid materials such as concrete or brick and will perform as good or better than these other materials over the lifespan of your house. By using a timber frame, you will be protecting your family and your valuables for many years to come. 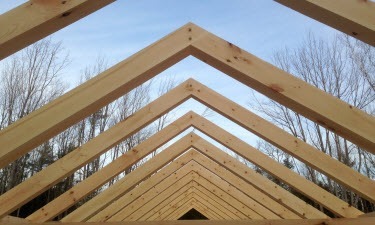 Timber frames have many applications in the “Green” movement as well. Locally harvested timber that is used in its undried state doesn’t require the energy of kild-dried wood. Timbers are also reusable as either salvaged timber or may be repurposed into other building components later in its lifetime. This type of reuse can be very important when deciding what types of materials you use in a homebuilding project. While building with timbers can sometimes add to the cost of the project, the benefits of timber frames are clear and often add much more in value than any dollar figure can represent. Come visit one of the homes in Benjamin & Company’s portfolio and we are sure you’ll agree! If you’re ready to take the next step to building your custom timber frame home, schedule a Free Design and Project Consultation with Ben today! Posted in Articles Custom Home Design Post and Beam Timber Frame and tagged with custom timber frame houses timber frame houses timber frames .